Working at a college has its advantages. Having access to such a big group of smart people comes in handy for me in my daily life, especially when it comes to some of the larger problems I run across. In the years I’ve been there, I have spoken with English professors about writing, political science professors about the goings-on in the world, and religion and philosophy professors about, well, religion and philosophy. I would call none of our conversations a sharing of ideas. Their words and the diplomas that hang on their office walls are proof enough they are much more intelligent than little ol’ me. I’m good with that. There are advantages to being the dumb person in the room. So the other day when my mind asked a question my heart had trouble answering, I went knocking on some office doors. The first chair I sat in was in front of four bookcases that stretched floor to ceiling and were stuffed with titles I could barely pronounce. The professor—smart fella, with a Ph.D. in philosophy courtesy of an Ivy League school—looked at me with kind eyes and asked what was on my mind. The professor took off his glasses, rubbed the lenses with a handkerchief. Then he put the glasses back on and looked at the bookshelves behind me, looking for an answer. “Let’s see,” he told me. He rose from the chair by the desk and brought down one book—this one old, with a worn leather cover and yellowed pages—and then another, this one so new the spine cracked as he opened it. He talked for ten minutes about free will and time being an unfinished sentence. Or something. My nods at first were of the understanding kind. The ones toward the end were because I was fighting sleep. I still don’t know what he said. It wasn’t the first time I’d walked into a professor’s office with one question and walked out with a dozen. To make matters worse, my mind was still asking that question and my heart was still having trouble answering it. What’s the point of praying for anything? Because it seems a little presumptuous to ask for anything from a God who already knows what I need (and what I don’t). I left Ralph to his cheeseburger, answers in hand. And honestly, that answer made sense. Because life—better life, anyway—is always about Him more than about us. And I left with other wisdom, too. The next time I have a question, I think I’ll spend less time in a professor’s office and more time down at the Dairy Queen. It began like most problems do—small and sudden. One a drive down an empty two-lane road with windows open, stereo blaring, and me doing my best Kenny Chesney impersonation. Work was done, home was ahead, and I had raw meat, a hot grill, and a ballgame to look forward to. Yes, life was good. But then a county police car rounded the curve ahead of me and I spotted the tell-tale radar jutting out from the driver’s side window. And whether you’re doing a hundred or twenty-five, your first reaction when you see such a sight is to slow down and check your speedometer. I did and did. The good news was that I wasn’t speeding (much). The bad news was that a red light was glowing on my dashboard. I raised my sunglasses and squinted, hoping that the light was not a light at all. Maybe it was a reflection of the sun or a peculiar shadow. Maybe I was just seeing things. I tapped the glass while keeping an eye on the road, but the light wouldn’t turn off. So I took the next logical step—I put my sunglasses back on, turned Kenny Chesney back up, and kept driving. Not simply so I could watch the road, but because I was trying to convince myself that if I wasn’t looking at the light, it wouldn’t be on. The modern motor vehicle is a technological wonder that can give you detailed information about a myriad of mechanical functions, but it cannot communicate more vaguely than CHECK ENGINE. Those two words of detached brevity can mean anything from a loose gas cap to a blown head gasket to nearly everything in between. So when I got home I paused to unscrew the gas cap, tighten it again, and restart my truck. All of which required a trip to the local repair shop, about two hours of my time, and more than a few bucks to diagnose and fix. And even though the guys down at Eavers Tire are great to hang around and talk with, I could think of a few better ways to spend a Saturday morning. But I don’t. Yesterday I resorted to covering that tiny part of my instrument panel with duct tape so I wouldn’t have to see it anymore. That didn’t work, either. I couldn’t see the light but I still saw the duct tape, and I knew why it was there. A part of me still thinks the light will go away if I ignore it long enough. I should know better, yes. This isn’t the first time I’ve had to battle warning lights, and not just with my truck. With my life, too. Like when I find myself choosing to stand in the rain rather than go looking for some sun. Or when my gaze begins to wander down instead of up. When I go for a bit without smiling or a long time without laughing. 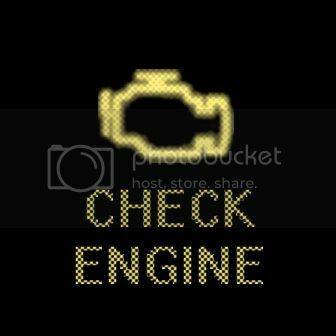 That’s when I know something’s wrong with my engine. CHECK HEART, my brain says. And I should. Really. But I often don’t. That sort of thing would be much like taking my truck into the shop—it would cost too much and take too much time. So I stumble on ignoring the fact that something somewhere inside me has tripped an alarm. When paying no heed to that warning turns CHECK HEART into CHECKHEARTCHECKHEART, I’ll use a little duct tape on my soul, too. I’ll start thinking that the cure for my blues could be as simple as a movie night or a pint of Starbucks ice cream. Sometimes both. That never works, though. Because the duct tape I use to cover what’s wrong inside me is much like the duct tape I use to cover what’s wrong inside my truck.